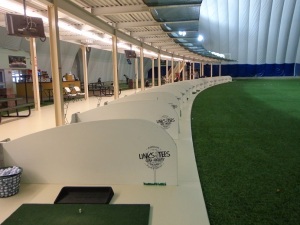 INDOOR AND OUTDOORS, The Best Deal in DuPage County, Links & Tee’s Golf Dome and Facility on Lake Street in Addison. (630)-233-7275 Ext. 4, visit online Addisonparks.org. Need a spring tune up lesson, now is the time. Open today until 10 PM, rates start at just $12, and only $10 after 7 PM. By: Rory Spears, Editor & Director of Content. Follow Rory on Facebook, Linkedin, and Twitter @GogBlogGuy. The Squeeze, based on actual events. Directed and written by longtime ABC sports producer Terry Jastrow, produced by Jastrow’s wife the Oscar nominated and Golden Globe award winner Anne Archer. Lights, Camera, Action, the Gog Blog ventures into movie reviews for the first time and of course golf is the main reason why. Coming to theaters on April 17th is the best golf movie to come along in a long time. 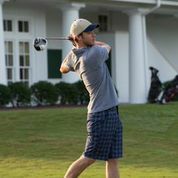 Whether years from now movie buffs will like it better than the great golf classic movies like Caddyshack, Tin Cup, The Legend of Bagger Vance, Happy Gilmore, or the Greatest Game ever Played, remains to be seen. But I’m sure it will be on any golfers list of the best golf movies ever made. 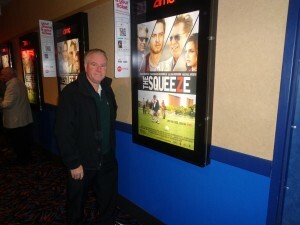 Jastrow and Archer along with producer Brain McCormack assembled a great cast in putting “The Squeeze” together. Dammed if you do, dammed if you don’t is where actor Jeremy Sumpter, who stars as 22 year old Augie Baccas finds himself, as he gets caught in a squeeze. Long before the squeeze goes down, the movie starts with Baccas emerging as a golfer with some real talent. Then the challenge for Baccas is whether to go try and win a U.S. Open, or play some high pressure games for serious money backed by high rollers in the gambling world. 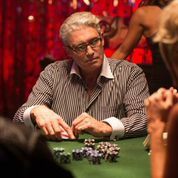 Michael Nouri as high rolling gambler “Jimmy Diamonds”. After winning a local tournament, Baccas meets a high rolling gambler named “Riverboat” played by Chris McDonald of Happy Gilmore fame, who has a plan for his newly discovered young talent, that doesn’t include winning a U.S. Open. While the relationship between the two doesn’t start off the best, and or ever develop that well both Baccas and Riverboat continue on around the country and finally ending up in Las Vagas. With both Jimmy Diamonds and Riverboat demanding Baccas lose or die, or win or die, in a big stakes match against the newly crowned U.S. Amateur Champion, Baccas and girlfriend Natalie (Jillian Murray) must create a plan to out scheme the schemers. The movie takes you from courses in North Carolina, across the country to the course at the Wynn Hotel on the strip in Las Vegas. The fun opening to the movie had me hooked, and the story developed that kept me interested all the way through. The movie is funny, suspenseful, and has enough “action” to keep your interest. Golfers and gamblers should especially enjoy the movie. Their is a special showing at the Bensenville Theater on March 30th, in conjunction with the Illinois PGA. Starting April 16th, look for a release through OnDemand and Groupon. The Movie hits selected theaters on Friday April 17th. It runs 95 minutes and it is rated PG-13.